What's The Cost of Wooden Flooring? There are a number of factors that attribute to the cost of laying a wooden floor, and with a little work, there are ways to keep costs down. Whether you’re doing the entire project yourself, or getting a professional in to help, you can often knock down the price with the following steps. Clearing a room, pulling up the carpet and disposing of the waste materials doesn’t require a lot of skill. If you get your installers to waste their valuable time doing this, then you better be ready to pay for the extra labour. But you can do this yourself very easily and it won’t take long to do. Then, when tradesmen come to measure up, you’ll be in a good position to negotiate. Though you might not have initially considered it, when wooden flooring is installed, existing skirting is normally removed and thrown away. Floorboards can then be laid right up to the edge of the room with the required breathing room. New skirting is applied or threshold strips can be attached directly to the wall for a clean, chic finish. Again, by doing this low-skill job yourself, you can save your floor installers time and reduce overall costs. Though many installers might prefer to do this job themselves, if you’re trying to keep costs down, then it’s worthwhile installing the underlay yourself. What’s essential is that you end up with a perfectly level floor. On concrete foundations you may need to use a self-levelling compound, as well as putting down a damp proof membrane. On other foundations you can simply buy foam underlay, roll it out and cut it to shape. It’s best to allow the room to settle for a few days before fitting the flooring. Up to this point, the project is relatively simple. However, the actual fitting of wooden flooring can be difficult depending on your experience and the tools you’ve got to hand. Click-together laminate flooring is relatively simple to lay if you’ve got basic carpentry skills. Meanwhile, if you want to use engineered materials, you may want to research wooden floor fitting costs as it’s more difficult to install. Whilst engineering flooring normally comes with a tongue-and-groove fastening, solid wooden boards need to be nailed or glued down. They’re harder to work with and it’s also more costly if you make a mistake. Flooring Costs – If your skills are up to the task, then installing a wooden floor yourself can be a great way to save money as you’ll only need to pay for the materials themselves. You can work at your own pace, and though it might take longer, at least you won’t have fitters disrupting daily life. Depending on the material, costs can be as low as £16 for a pack of laminate flooring to cover roughly 1.25m² and around £25 for engineered wood for the same area. That’s between £345 and £540 to cover 27m²; though it should be noted this is at the budget end of what’s available. As a comparison, a single square metre of solid wood can cost upwards of £50. Accessories – When you’re pricing up your new floor it’s essential not to forget about the accessories. Underlay, threshold strips, pipe surrounds and new skirting boards will soon add up, not to mention the costs of paint if you need to give skirting a fresh face-lift. For peace of mind, and to make life easy, you might want to get professionals in, either to lay the floor, or to do the entire project. It’s important to negotiate as much as possible, especially if you’ve already done some of the groundwork. You should also seek to get at least three quotes as fitting costs will vary. 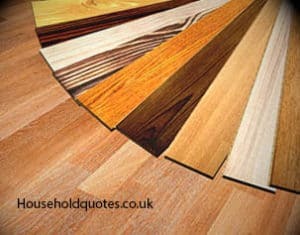 If you’re having laminate flooring laid over a 27m² area, you can expect costs of around £1,000 to £1,400. Meanwhile, if you’re having a solid wood floor laid, then costs will be at least £1,000 more. Because of the expense of such a project, it’s a good idea to use a trusted service like Quotatis to be sure you’re collecting quotes from legitimate, reliable firms. Wooden flooring can be an extremely beautiful and robust addition to your home. Luckily, there are several ways to keep costs down so that, regardless of your budget, you can enjoy this modern home décor feature.